Front of the former Metropolitan Hook and Ladder Company, August 2010. Discovered in June 2010 to be an Adolf Cluss building, the Metropolitan Hook and Ladder Company’s Fire Engine House is one of eleven buildings that Cluss designed that still stand, and the very first one of his buildings to be completed. 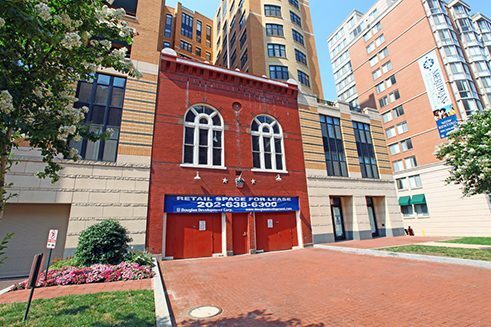 Dedicated in February 1864, it is still standing at 438 Massachusetts Avenue NW, seemingly lost in the middle of a new residential building. The Metropolitan Truck House.— The Metropolitan Hook and Ladder Co.’s truck house, on Massachusetts avenue, between 4th and 5thstreets, has been completed, and on Monday the key was delivered to Mayor Wallach, who turned the building over to the custody of the company. The building is a fine structure of two stories, 30 feet in width, and 60 feet deep in the clear. The first story is 11 feet high, and will be occupied by the trucks, and on the back of this floor there are bunk rooms for six persons. The second story is intended as the meeting-room, and is 17 feet high. This hall has, at the north end, a light iron gallery for an orchestra, and is furnished with chandeliers. A hot air furnace heats the building, which also has every convenience such as Potomac water, water closets, ventilators, &c. The front of the building is of press brick, and is highly ornamented. The two main doors are 16 feet by 7, between which is a small door to the main hall, which is reached by a spiral staircase. The windows are in the French style. The building is surmounted by a handsome belfry 11 feet high, built partly on a projection of the front wall, 3 feet 6 inches from the face of the building, on top of which is a flag-staff, the top being 60 feet from the sidewalk. Over the front door is a handsome circular transom, surmounted by a fine piece of marble-work, executed by W. Flannery, representing a fire-hat, with ladders, hooks, &c. The building is a substantial one, and was erected under the supervision of Mayor Wallach and Aldermen Clephane and Utermehle. The structure was planned by Adolf Cluss, architect, and erected by the contractor, J. A. Blau, who did the carpentering. Moses Merrill bricklayer, Wm. Carr painter, W. Flanagan plasterer, George Goodall plumber, and F. & A. Schneider iron-workers, were the master mechanics employed. The building reflects great credit on all concerned, each department of the work having been done in a substantial manner, and the entire cost, $5,000, is regarded as very low, when the size and character of the work is taken into consideration. The belfry and steeple were removed in 1877.